I had just come back from New Year holidays when my boss asked me to go to Shenzhen because my knowledge was required for our new office opening ceremony (note: my competences are that I can speak French and know the projects that I am working on every day). My boss sent me there 3 days to prepare the event. 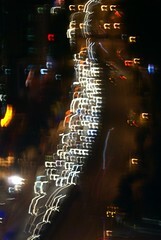 I was happy because the temperature there was around 15-20 Celsius degrees and it was below 0 in Beijing. 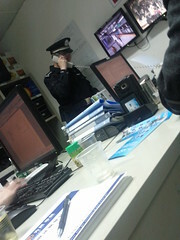 Bustle as soon as I arrived in the office, my colleagues called the airport, IT service or police station to retrieve some information. After few hours, I was without computer, without my hotel address and without my flight back details. Not easy to be in an unknown city without this information. I had to go to the police station to declare the event. First visit, the responsible is not here and other people are not able to fill in right documents, come back in one hour! Like any police station in any country, you need to be patient as you stay there for a long time to get the right document. Note that they were kind, they gave us some tea. A big thank you to my Chinese colleague who translated the discussion and was a warrantor on my case. I must fail to declare the stolen laptop without his help. 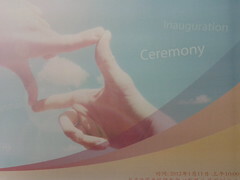 Otherwise, the opening ceremony was all right, really big ceremony for our small office. I did a bit of networking with some of our key partners and I even met one of my former colleagues in France who lives in Shenzhen now. 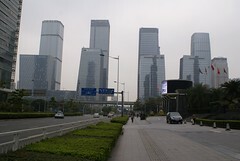 Shenzhen city is currently under development (like all cities in China). 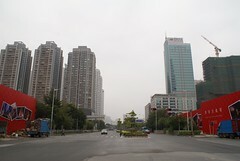 The air and weather are better than in Beijing, the sky is eventually bit blue but nothing sensational to visit there. 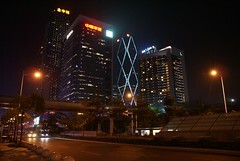 One biggest advantage is to be closed to Hong Kong for an extra week-end during a future business trip.